Reinforced Polyurethane-lined material handling hose with embedded copper grounding wire For outdoor dry applications. 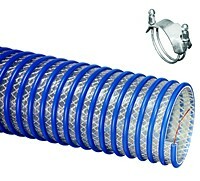 This product is designed to dissipate static electricity when the metal wire is properly connected to ground, through the fitting or other means. • FDA - CFR Title 21 Parts 177.1680, and 177.2600 requirements.